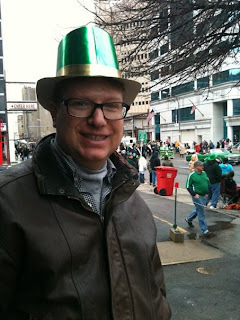 I did not make good on my promise to keep updating people yesterday on the Web log of what was going on at the St. Patrick's Day Parade. Howard kept posting pictures on Facebook which created a kind of soap opera, ending in a picture of me passed out in his smoking chair. Ha, ha! Above is a picture of Howard at the parade. 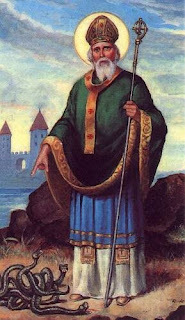 Below is a picture of St. Patrick driving the snakes out of Ireland. I like St. Patrick because I do not like snakes. After passing out in Howard's smoking chair I came to life and we went for a walk and then we went to E.B. Green's to celebrate the last night of Restaurant Week. Wow, this week. I have been eating and eating! 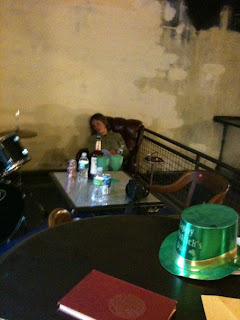 Going for our walk we found that the real drama of St. Patrick's Day is not the parade but what happens after. Such sights! Then there was one guy in front of Avant being beat up. These guys had him down on the ground and were kicking him. But he got up and fled inside Avant. He came out with a rent-a-cop and they were calling the police. That happens! ...was not so snooty. Drunks in jeans were coming and going and a bum was going through the garbage, collecting cans. 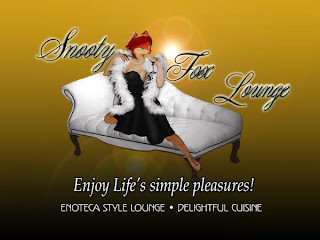 Poor Snooty Fox! Tomorrow is another day. Also on our walk we saw three people being carried home by their friends and two people who were still on their feet but needed to be supported. ... I was no one to talk. That is a fine image, Leonard Pennario's authorized biographer passed out in a smoking chair. Tomorrow, to the gym with my overserved, overindulged self.